From H.M's Secretary of State for India. London. To Political Resident A senior ranking political representative (equivalent to a Consul General) from the diplomatic corps of the Government of India or one of its subordinate provincial governments, in charge of a Political Residency. at Bagdad. Dated 23rd received 24th May 1935. 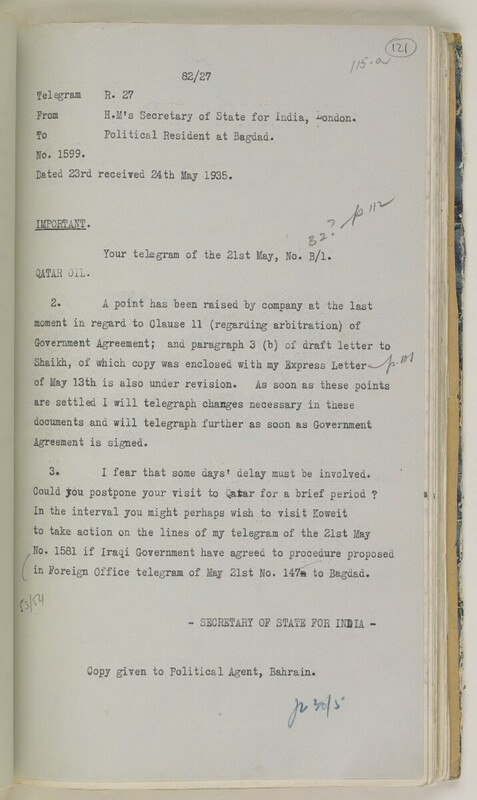 Your telegram of the 21st May, No. B/l. 3® I fear that some days T delay must be involved. Could jrou postpone your visit to Qatar for a brief period ?